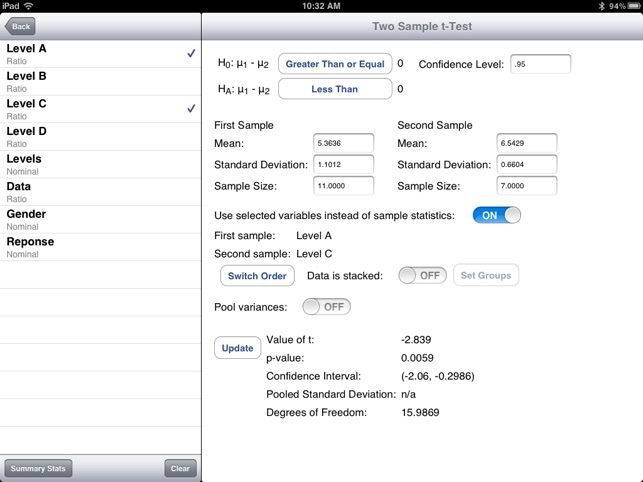 TC-Stats is a complete data analysis application for the iPad. The application performs the following functions: Summary Statistics, Histograms, Box-and-Whisker Plot, Normal Probability Plot, Scatter Plot, Frequency Distribution Table, Probability calculations based on the binomial, standard and non-standard normal, t, f and chi-squared distributions, one and two sample hypothesis tests based on the t and standard normal distributions, sign test, Wilkcoxon Rank-Sum, F-test, odds ratio, confidence intervals, one-way anova, Kruskal-Wallis test, chi-squared test of independence and goodness-of-fit, sample size calculations for inferences regarding a population mean or proportion. 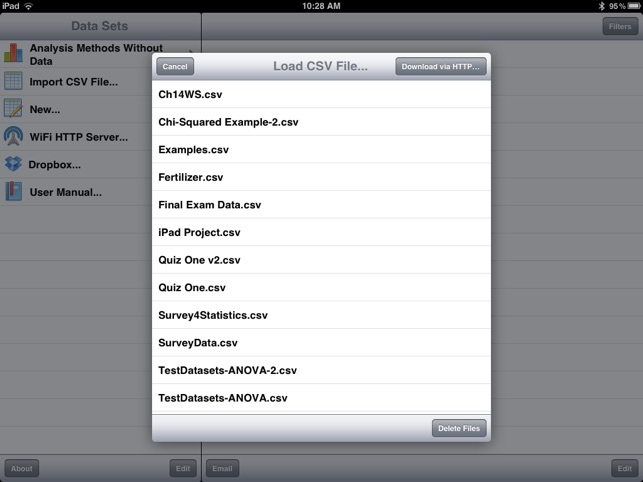 TC-Stats imports data files in csv format and has Dropbox support and supports both stacked, and unstacked data for most techniques. Profits from TC-Stats support STEM scholarships at Taft College, California. I am an English major, so I have no inclination towards math WHATSOEVER, and I like it that way. But I had to take Statistics for my Gen Eds, and this app is SO helpful with my homework. If you go through the manual (or watch the videos) and take your time, this is perhaps the gateway to an easier understanding (or at least completion) of almost any statistical problem your professors and/or your bosses can throw your way. I am completely serious here, I have no idea how to work a graphing calculator, and I probably never will. But this app does all of the more complex functions of a graphing calculator (and, frankly, you can download a regular calculator off of iTunes anyways) in a much simpler manner. I recommend it for anyone, whether they be math-inclined or math-loathing such as me. If stats is your thing, I would HIGHLY recommend that you download TC Stats at this very moment! 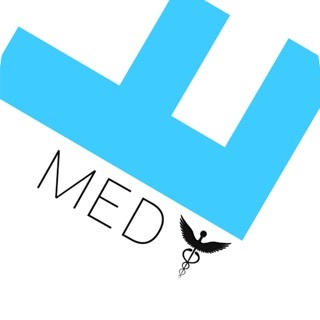 Easy to use, quick to learn, and very in-depth; what more could you ask for in an app? Buy TC Stats now, and you won't be disappointed! 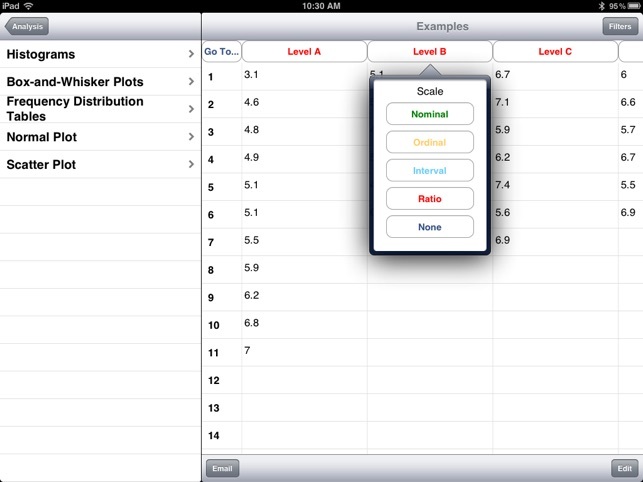 This stats app is great for classroom use. It is also useful for any quick descriptive stats you may need. Graphing functions are quite nice. I also like the multiple export formats. Definitely worth the buy.